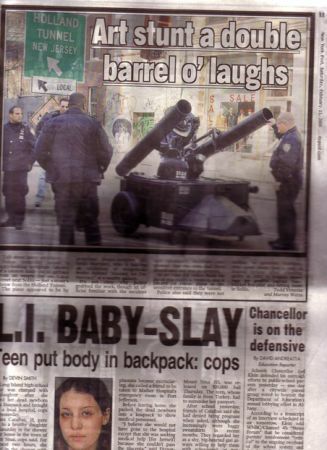 PROPOSITION artist, ALFREDO MARTINEZ, aka ‘the man who would be Basquiat’ made PAGE 11 of SATURDAY’S NEW YORK POST (FEBRUARY 11, 2006) with a breath taking publicity hound’s dream .. a 1/2 page photo of 4 of NYPD’s FINEST surrounding one of his big gun sculptures on an empty lot off Canal Street, near the Holland Tunnel. The word on the street & from sources in the know, who’d rather remain anonymous for good reason, confirm that the large gun sculpture on wheels, in the POST photo, is indeed an Alfredo Martinez Saturday night special.. Knowing Alfredo, it wouldn’t be a stretch, to assume that he himself, might have been the …civic minded “community member(s)” who tipped off the police to the ‘heavy artillery’ on Canal Street… and supplied the well-timed heads-up to the POST lensman who just happened to stroll by, in time to catch the action! 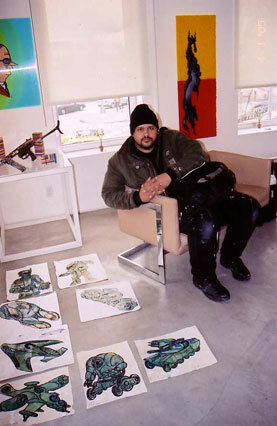 Turns out Alfredo has a show, ‘Arsenal for Democracy’ in a 4th floor loft at 343 Canal St. between Greene & Wooster — who wouldn’t want a 1/2 page photo in the SATURDAY NEW YORK POST, over a 1/4 pg paid ad in ARTFORUM! 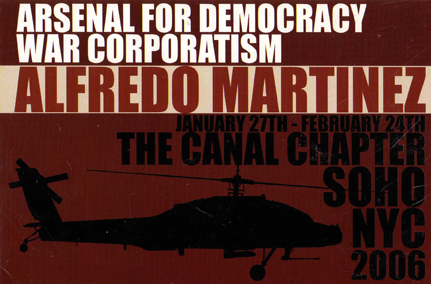 here’s the card for: ALFREDO MARTINEZ … ‘ARSENAL FOR DEMOCRACY – WAR CORPORATISM’ – which ran from JANUARY 27th – FEBRUARY 24th, 2006, at THE CANAL CHAPTER, SOHO, NYC. the cops confiscated the piece – they hauled it away on a flatbed truck. Another big part of the story is THE CANAL CHAPTER itself. If you like your art served up straight up from the street, 100% pure juice, this is real deal. Run by GUERRILLA STREET ART CREW – 1134 NYC – aka JASON WALL & MIKHAIL (MIKE) SOKOVIKOV aka MIRF, THE CANAL CHAPTER operates a raw loft/art/gallery/event/party space on the 4th floor of 343 Canal St, between Greene & Wooster. With their street cred down, these 2 talented young artists are moving to cross over into the mainstream artworld, with their own art & the art they exhibit. ALFREDO MARTINEZ had a few more large scale – STAR WARS – like artillery pieces, like the one that made the POST, up in the loft … seeing is believing. more info & photos on the Greene St: to post soon. Federal courthouse Nov 19, 2002 and scroll down to the bottom. note: that ‘s Leo (Lio) Malka at the end of the 3rd row, at the top of the report.